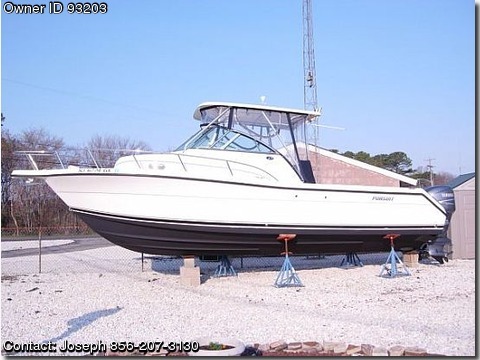 Call Boat Owner Joseph 856-207-3130. Original owner Additional Specs, Equipment and Information: Boat Name No Name Specs Builder: Pursuit Dimensions LOA: 28 ft 0 in Beam: 9 ft 6 in Minimum Draft: 1 ft 9 in Maximum Draft: 2 ft 6 in Displacement: 7570 lbs Bridge Clearance: 9 ft 2 in Deadrise: 22 ° at Transom Engines Engine Brand: Yamaha Engine(s) Total Power: 450 HP Engine Model: T - Yamaha 225 HP 4-STK Engine Type: Outboard 4S Propeller: 2 blade propeller Cruising Speed: 30 knots Maximum Speed: 40 knots Year Built: 2006 Engine Hours: 100 Trim Tabs Tanks Fresh Water Tanks: (20 Gallons) Fuel Tanks: (234 Gallons) Holding Tanks: (20 Gallons) Accommodations Number of single berths: 1 Number of double berths: 1 Number of heads: 1 Electrical Equipment Electrical Circuit: 110V Outside Equipment/Extras Electric windlass Accommodations The forward dinette converts to a large double V-berth with filler cushion. There arre storage lockers under the berths, side storage shelves, two opening ports and an overhead ventilaation hatch. Located aft under the bridge deck is a single mid-cabin berth. Aft to starboard is the stand-up head compartment which features a vanity with sink, toilet with mascerator and holding tank, shower, storage locker, mirror and an opening port. The entire cabin has teak and holly soles, coordinaing fabrics and designer accessories. She is truly upscale, spotlessly clean and will not disappoint you. Galley Located aft to port, the galley features a molded sink, undercounter refirgerator/freezer, microwave, lockers for storage and an opening port..